Pour forth, we beseech you, O Lord, your grace into our hearts, that we, to whom the Incarnation of Christ you Son was made known by the message of an Angel, may, through the intercession of the Blessed Virgin Mary, by his Passion and Cross be brought to the glory of his Resurrection. Who lives and reigns with you in the unity of the Holy Spirit, one God, for ever and ever. The Rosary and the Christian Wake | Alfred C. Rush C.SS.R. The Rosary Encyclicals | Thomas A. Thompson S.M. According to the 1962 Missal of St. John XXIII the Extraordinary Form of the Roman Rite, today is also the feast of St. Mark, who succeeded St. Sylvester and was pope for eight months during Constantine's reign. He zealously continued the great work of Church organization made possible by the period of freedom from persecution due to the Emperor's conversion. He built two churches in Rome, one of which, the titulus Marci, has become the church of St. Mark, and still exists. He died in 336. This feast was instituted by Pope St. Pius V in thanksgiving for the great naval victory over the Turks at the battle of Lepanto on this day in the year 1570, a favor due to the recitation of the Rosary. This victory saved Europe from being overrun by the forces of Islam. Lepanto, perhaps the most complete victory ever gained over the Ottoman Empire, on October 7, 1571, is commemorated by the invocation "Help of Christians," inserted in the Litany of Loretto. At Belgrade the Turks were defeated on the Feast of Our Lady ad Nives in 1716. A second victory gained that year on the Octave of the Assumption determined Pope Clement XI to command the Feast of the Rosary to be celebrated by the universal Church. 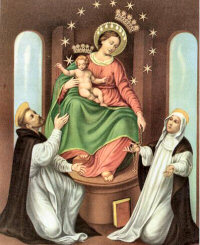 Leo XIII added the invocation "Queen of the most Holy Rosary, pray for us," to the Litany of Loretto. The Feast is in reality a great festival of thanksgiving for the signal and countless benefits bestowed on Christendom through the Rosary of our blessed Queen. In modern times successive popes have urged the faithful to pray the Rosary. It is a form of contemplative prayer, mental and vocal prayer, which brings down God’s blessing on the Church. It is a biblically inspired prayer which is centered on meditation on the salvific mysteries of Christ in union with Mary, who was so closely associated with her Son in his redeeming activity. Pray the Rosary, or 5 decades of the Rosary tonight with your family. Continue this practice through October, the month that is especially dedicated to the Rosary. Read the encyclicals on the rosary, and the latest apostolic letter. Learn the Luminous Mysteries. For families with younger children, it helps to have visual aids for the mysteries. Have a picture to flip at the beginning of each decade for the family Rosary. See the Activities Bar for ideas. Learn how to make rosaries, cord and/or wire for missions. Learn about the great victory of Our Lady at the Battle of Lepanto. You can also read more about Pope St. Pius V, who instituted the Feast of Our Lady of the Rosary. Read Cardinal Angelo Sodano's homily at the Shrine of Our Lady of the Rosary. [T]he recitation of the Rosary could be made more solemn in tone "by introducing those Scriptural passages corresponding with the various mysteries, some parts could be sung, roles could be distributed, and by solemnly opening and closing of prayer." The custom of making an insertion in the recitation of the Hail Mary, which is an ancient one that has not completely disappeared, has often been recommended by the Pastors of the Church since it encourages meditation and the concurrence of mind and lips. Foods for this feast: Since the origin of this feast came from the Christian fleet defeating the Turks at the Battle of Lepanto in 1570 through the intercession of Mary through the Rosary, why not make a cake in the shape of a ship? See the top bar for a cut-out cake, or make moderations to this Ship Cake. Read more about the Battle of Lepanto for ideas. St. Pius V was a very holy Dominican, who wore his scratchy habit underneath his papal robes, and walked around Rome barefoot. He ate just to sustain himself, and fasted frequently. We should use his example and remember to fast and pray the Rosary for the conversion of Islam. Prominent among the clergy, Mark, the son of Priscus, was elected to the See of Rome just eighteen days after the death of St. Sylvester. A Roman, Mark was described as a man who was "filled with the love of God, the guardian of justice, a true friend of Christ." Mark is credited with instituting the ancient custom of a pope being consecrated by the bishop of Ostia. He is also said to have issued an edict whereby the bishops of Ostia were granted the pallium by the pope. The pallium, a circular band of wool, is the symbol of apostolic power worn by the pope; when it was bestowed on an archbishop, it symbolized his participation in that power. Mark's pontificate, although short, occurred during times of great change. The heretic Arius was dying, nevertheless his followers continued to grow in strength in the East, and as a result such great leaders of the orthodoxy as Athanasius of Alexandria were deposed. Emperor Constantine still reigned, and he was no less generous toward the new pope. He bestowed on Mark two more basilicas: one in the cemetery of Balbina on the Via Ardeatina; and the other, the church of St. Mark, originally named for the pope. Mark died peacefully on October 7, 336, the same year in which he was elected. He was buried in a place of his own choosing, the cemetery of Balbina.